Yay! I’ve been experimenting with photo editing in Lightroom and I just started playing with tint. Now my Pomegranate Persimmon salad looks like it’s floating in a magical unicorn land. Yesssssss. About this salad… it tastes really good! I made it for Thanksgiving and it was a huge hit, even with all of my friends chowing down on turkey. It also made for excellent leftovers when everyone wanted a nice, light, vegan meal the next day. 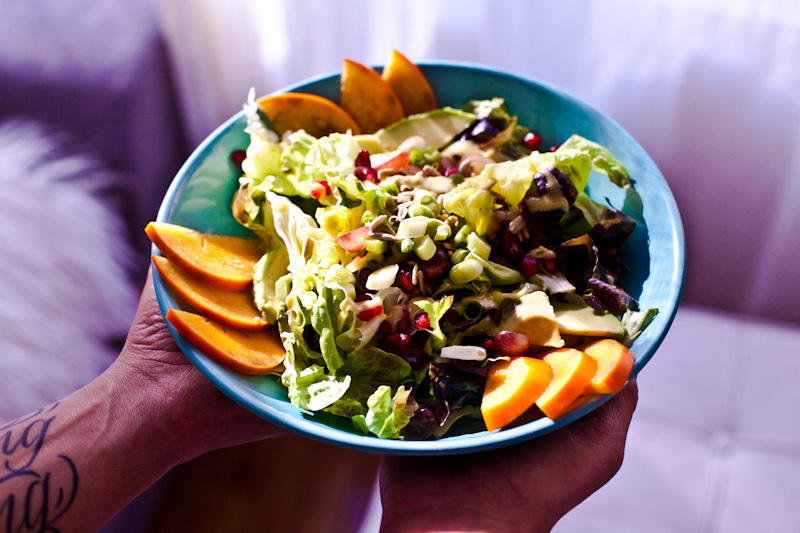 This salad is packed with healthy, raw, whole foods. I am all about eating to feel good and this vegan dish really hits the spot. It packs a punch nutritionally. It’s chock full of antioxidants and all those bright, beautiful colors that our bodies really crave. Even if you aren’t vegan or vegetarian, incorporating more colorful fruits and veggies into your diet is always a good idea. Speaking of anti-oxidants, I looooooove pomegranate! So tart and juicy. It’s a bit of work to get the seeds out and the juice stains like crazy, but it’s totally worth it! If you are in a rush, most Trader Joe’s carry pomegranate seeds in a little package. But plucking them out and eating them one by one is completely rewarding, I suggest that! Another bright color I can’t get enough of- ORANGE. I’ve been eating persimmons in everything lately. I love when they are in season. They taste like cotton candy tomatoes and their vivid color makes every dish look more appetizing. Toast the sunflower seeds in a skillet over medium low heat with 1 tsp of coconut oil and a sprinkle of sea salt. Stir often for 1-2 minutes. These can burn easily so keep an eye on them. Drizzle 1-2 tsp of dressing on each salad. If you have tempeh bacon bits, definitely try that! The smokiness really rounds out of the flavors of this salad, but it's super delicious without them. Dressing- Combine all ingredients in a blender and blend for 1-2 minutes until smooth and creamy. Add water 1 tsp at a time if it's too thick.